One of the problems I ran into in my earliest exploration of Paganism was encountering things that simply weren’t Pagan. Things like archangels, the Tree of Life, and the Key of Solomon. I knew these weren’t Celtic or Greek or Norse – they’re Jewish and Christian. Because I grew up in a toxic form of Christianity, I needed to make a clean break with that tradition. The religion I write about here is an attempt to reimagine the beliefs and practices of my pre-Christian ancestors for here and now. That’s a challenge when it comes to religion. It’s even harder when it comes to magic. 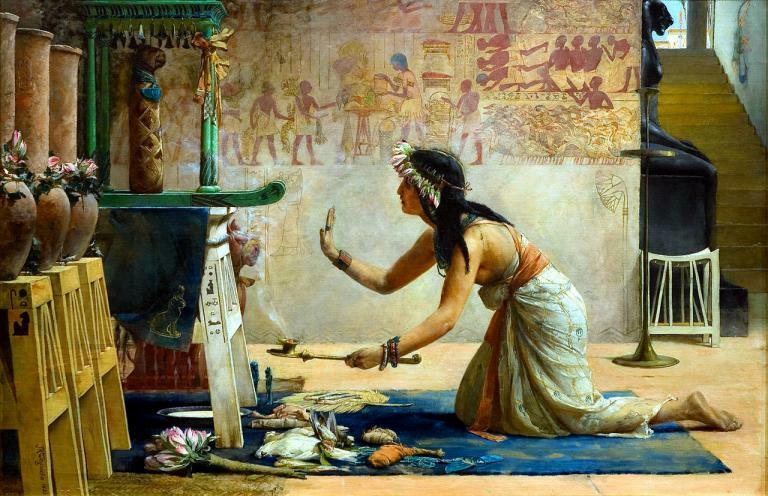 The magical tradition of the West – which includes ceremonial magic and traditional witchcraft – has roots in ancient Greece, Rome, and Egypt, but it’s been filtered through centuries of Christian and Jewish belief and practice. That’s a problem for those of us who work in a Pagan and especially in a polytheist worldview. Have you ever worked in systems that are part of an Abrahamic tradition (grimoires for example but even the Golden Dawn)? If so, do you follow the rituals as they are or do you “Paganize” them? I haven’t done this often, but I have done it. So let’s explore the question of repaganizing ancient rituals. My primary role is that of a priest, not a magician. My religion is a magical religion, but its core is the worship of the many Gods. When I have a need for magic, I either work simple kitchen witchery or I do sigil magic. 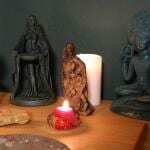 In either case, I almost always enhance my own working with prayers and offerings to Gods and spirits with whom I have an existing relationship. Relationship first, function second. I consulted spell books (Cunningham, etc.) when I was getting started, but I soon started writing my own. Then I learned sigil magic, which has produced some amazing results for me. So both religiously and magically, I don’t have much need for ancient magical spells and rituals. But sometimes there is a need. I want to be clear that magical practices and traditions that are rooted in or influenced by Christianity and Judaism aren’t wrong. People have been working in them for hundreds of years with good results. If you want to learn the Golden Dawn, go join the Golden Dawn and learn what they have to teach, as they teach it. Much of the power in these ancient rituals comes from centuries of repetition in their current form. You can’t expect to plug and play with different Gods and expect them to work exactly like they’ve always worked. But some ancient rituals and spells were Pagan before they were Christian. They were created in a polytheist environment, so it stands to reason that if they’re restored to a polytheist environment they’ll still work… perhaps even better. Magic is near-universal in human societies. The “low magic” of common people takes many forms and there is significant overlap in practices from culture to culture. But the “high magic” of the grimoires and of the 19th and early 20th century magical orders have their roots in the melting pot that was Alexandria (on the Mediterranean coast of Egypt) in the first centuries of the Common Era. 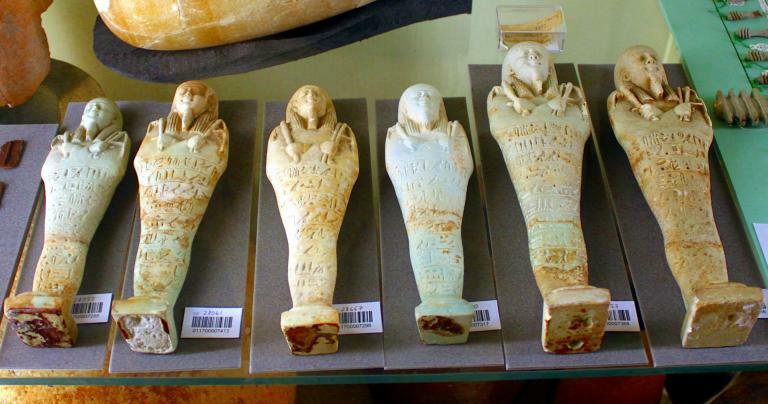 Alexandria had what was left of ancient Egyptian religion. There was significant influence from the Greeks – the Ptolemaics controlled Egypt from 305 BCE to 30 BCE. It was ruled by the Roman Empire, which was the most religiously diverse society in history until our own. There were Jews and Christians, and people from further East and further South. 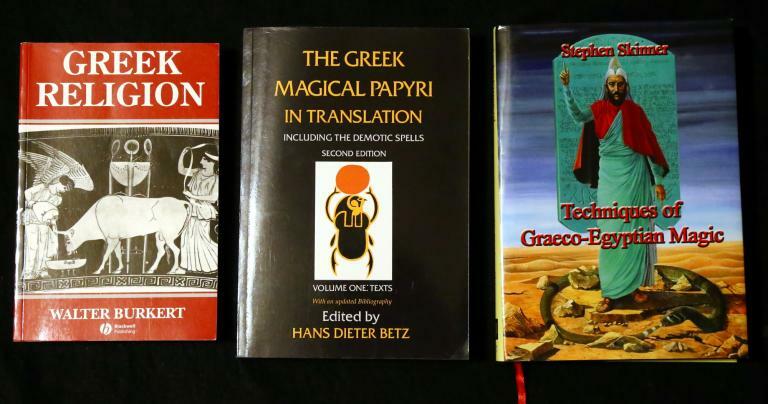 Much of what survives from that period is collected in the Greek Magical Papyri (the PGM), which is a modern collection of spells from around 100 BCE to 400 CE. There is still some debate as to who wrote the spells, with some scholars arguing for a secret magical tradition and others (the majority, from what I can tell) arguing they were the side gigs of temple priests. So when you’re talking about ancient rituals from the PGM and its descendants, you’re talking about rites that began in a polytheist society. Can we remove the monotheism from them and use them in a contemporary polytheist context? Any time you’re composing a ritual – whether that’s a simple spell, a complex working, or a seasonal celebration – begin with the question “what am I trying to accomplish?” Whatever your goal, in most cases there is no need to go outside of your own tradition to accomplish it. Further, if you write something new you’ve now added material to your tradition. Why work on reclaiming magic from monotheist-influenced sources when you can build up polytheist sources instead? This is why I don’t do much repaganizing of ancient rituals. But there are exceptions to every rule. Sometimes there’s one ancient rite that’s designed to do exactly what you need. Only the text you have is clearly influenced by monotheistic thinking. Maybe that’s no big deal for you. Maybe you grew up non-religious and Christianity is just one more flavor to you. Or maybe you grew up in a liberal Christian environment and you don’t have the baggage I do. Or maybe you decide to repaganize it. Reverse engineering is a practice in manufacturing and especially in the tech industry. You get a finished product someone else has made, then you carefully disassemble it and try to figure out how it works. You see how they solved design or manufacturing problems you’re struggling with – and then you try to figure out how you can do the same thing without getting sued for patent infringement. What is each line of the ritual trying to accomplish? Who is it calling? What is it asking them to do? What themes does it express? What parts are clearly Pagan or polytheist? Now comes the hard part – what names, terms, and references are Christian or Jewish (or in some cases, Muslim)? Obviously, if you aren’t familiar with those religions you won’t be able to spot them. What might the original author have intended? What might the ritual have looked like when it was first written? Do it wrong and you won’t get sued for patent infringement – you’ll offend the Gods and spirits you’re trying to call and you’ll wish you were dealing with sleazy lawyers instead. Or you’ll end up with out-of-context gibberish and nothing will happen. 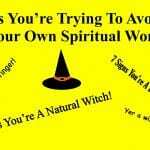 This is probably the biggest problem in working with ancient rites – very few magical practitioners can read ancient Greek or Latin or whatever language the spells were written in. We have to work with translations. All translations are acts of subjective interpretation. Any translation of Pagan material before the mid-20th century is highly suspect – the vast majority of them have a strong monotheist bias. And even good translations are problematic. Find the best and newest translation you can get. If you can also get the original texts, you can look up key words and see what choices the translator made, and decide for yourself if another word might have been better. Some things simply can’t be translated, and others shouldn’t. But the absolute last thing you should do is to start incantations with words you don’t understand. Don’t overestimate your abilities, and for the love of all the Gods don’t get into internet arguments with people who actually know the language. But if you’re going to this much trouble, you owe it to yourself to be as confident in the translation as you can be. In 2016 I performed the Headless Rite, one of the spells from the PGM. Gordon White of Rune Soup calls it a spell to “get their attention” and to “claim your place at the table.” I used it for multiple purposes, including stopping my thoughts of suicide. It worked – very well. It’s not a panacea, and it’s not a substitute for mental health care, but it was what I needed at the time. No, I won’t share my script. I pulled from multiple sources and there may be copyright issues if I publish it. But more than that, I’m not confident that the repaganizing that worked for me would work for everyone, and I’m not willing to accept responsibility for what happens to someone else. Get the Betz translation of the PGM. Get Gordon White’s The Chaos Protocols and carefully read Chapter Three “Becoming Invincible.” Do some googling and see how Aleister Crowley modified the rite (Crowley incorrectly called it the “Bornless Rite”) – decide where you agree with him and where you don’t. Then follow the re-engineering process described above. Read through it in a safe space (i.e. – where you won’t be heard in this world or in the Other – “I was just practicing so it doesn’t count” doesn’t work). See how it goes. Make adjustments as necessary. Then work your repaganized rite. If you want to be part of a magical system that works in a Christian or Jewish context, accept that that’s who they are and do it the way they do it. A magical system is a whole thing. And if you don’t want to do that, then find another system. That’s why I’m not participating in the grimoire revival, even though I’m fascinated by it. 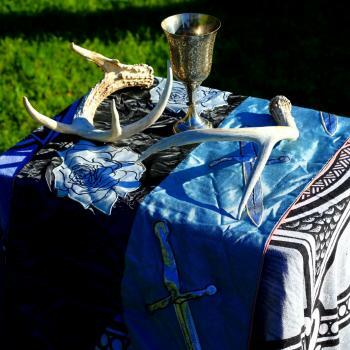 Most times you should be able to find a spell or ritual that meets your needs from within a Pagan and polytheist tradition. If you can’t, create one. It’s not that hard, and it’s a great learning experience. But if there’s an ancient rite you really need to do but you just can’t do it in the form you have it, it can be repaganized.